Today I take on the challenge of reviewing a site long-irrelevant and begging for a comeback. Myspace used to be on top of social media, and then they got downright creepy, lost to facebook, and hit rock bottom. Now myspace tries to reinvent themselves under the notion of a creative a music based social network, and I’d like to share my experience using their private beta with you. Stick around for the giveaway below! John Lennon once said “Give Myspace a chance” or something like that, so after not logging in for six years I gave them a completely open mind. To understand the new Myspace we need to look at past music social networks. The most notable example is Apple’s highly hyped Ping which fell flat and closed within a year. The reason Ping gained no traction was because of 1. the design, and 2. the business model. Ping ran only in Apple’s itunes which at the time hadn’t seen a major update in years. The old look of ping was tired and hard to navigate. Of course, old designs haven’t stopped every social network from growing (I’m talking to you Reditt). Where Ping really fell short was the model. It was all about the music you were buying, not what music you were in to. websites like Soundcloud and services like Spotify show that people want to share what they’re listening to in Realtime, and they don’t want to pay for it. With this knowledge in mind, the new owners of myspace completely tore up their original site, cluttered with sketchy people, ads, and embedded services and brought in a completely new design based on social discovery mixed with personality display tools. I’m not sure at this time what their monetization plan is, but currently the new myspace boasts an incredible collection of new and classic music available for free, and without an ad in sight. Every artist I looked for, I found, and the built-in playlist option makes it extremely simple to put my favorites together. 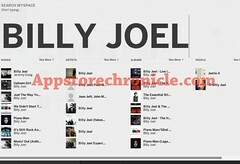 I currently have a playlist with literally (no joke) hundreds of Billy Joel songs from several full albums, dozens of Greenday songs, and at least one song (for the ladies) by Carly Rose Sonenclair of that darned TV show they all watch. The design is modern and minimalistic. When I first got to the site I was quite confused because there isn’t even a search box. Whenever you start typing, your search appears, and it’s real time and categorized as well. It’s a bit confusing at first, but I really like that design twist. For Pandora lovers, in addition to playlists, you can also listen to pandora-style “radio stations” of your favorite artists. The best part is that they’re ad-free (for now). The player is simply located on the bottom of every page (similar to the look of Google Music), and you can control your music fully from any page. Album art is prominently displayed when you scroll over the player which is nice when you’re reminiscing about an album, and music discovery by artist, title, or album is only a keystroke away thanks to the unique search, which is one of my favorite features. Although the new myspace is more music-focussed than its’ predecessor, they haven’t entirely ditched the social scene. Myspace currently offers very simple profiles with pictures, and customizes what tools you get based on what you say you are (i.e blogger, musician, Filmmaker, Photographer). I’m not sure how the profiles really fit in yet, but I have a feeling we may see more functionality on that end later. They also offer updates similar to tweets, or facebook posts. Instead of sharing links, and photos as you would on facebook, you can share songs as well on myspace, and it’s very well designed for ease of use. You can also connect with friends, creators, and artists, and it offers the obligatory messaging app. So, is it worth signing up? YESSS! With the depth and breadth of the entirely free and ad free collection, and the potential I see for this to become the next hipster haven, yes all the way. I doubt I’ll use the social features that much until the private beta ends and more of my friends join, but I’ll definitely frequent the fantastic music areas of the site. I never thought I’d say it but… I like myspace. Want an invite to the new myspace? Enter this week for an exclusive free giveaway. Beat the line! Learning To Count Cards…The Easy Way- An App!